Fortunately, the manual of the Wavetek has some detail on the leveler correction PROM. Essentially, it is fed with 8 bits representing the frequency, 255 (0xff) for 7.0 GHz, 0 (0x00) for 12.4 GHz. 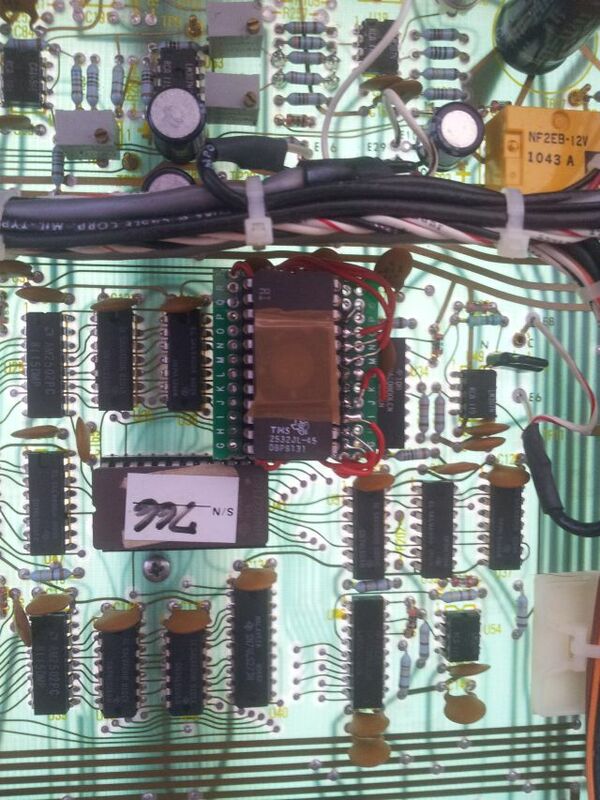 For each of the 256 steps, it has a correction byte stored in a Texas Instruments TBP28L22N 256×8 PROM. 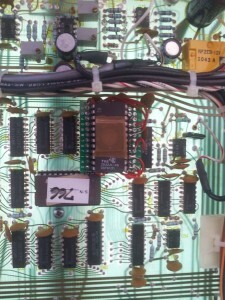 This is programmed at the factory, to match each individual RF deck. Getting this exact device and programming tools ready was out of question, some of these PROMS might still around, with datecodes of the 80s, but really not worth the effort and cost. Step (1) – A little test rig was set up, with the recently repaired HPAK 8904A as a DC source (can source -10 to +10 Volts, in very fine steps), and the DC voltage connected to the leveler correction control voltage line. The Wavetek is designed for servicability, and there is a nice jumper to disengage the actual level correction DAC, and the feed an external voltage instead. An EIP 545A was used as a frequency counter and power meter. 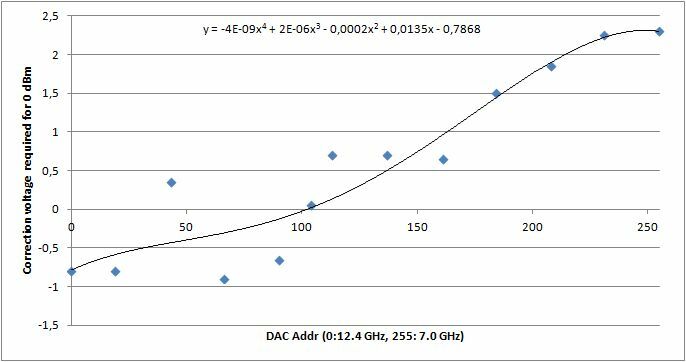 Cable and EIP 545A power meter accuracy was tested with my best calibrated source at hand, and found to be within +-0.5 dB over the 7 to 12.4 GHz band. Step (2) – Data were collected by setting the Wavetek to various frequencies, mostly in 0.5 GHz steps, and the control voltage was adjusted for the power meter to read about 0 dBm. The data were then used to calculate the coefficients of a forth degree polynomial, and converted to the 256×8 bit format. 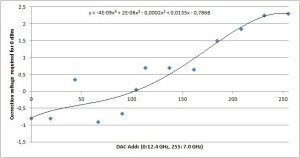 The Wavetek uses a DAC0800LCN DAC, and the output voltage (after the on-board opamp, a LM307N) was found to be very close to 10.00 V with 0xff input, and nearly -10.00 V, for 0x00. Step (3) – The tricky part. How to get a replacement for the 28L22 PROM? There are mainly two choices, one option would be to use a little microcontroller, that can easily function as a pseudo-memory, or use something more permanent, in this case, an EPROM. I had some 2532 around, therefore, not much effort. Only a small fraction of the 2532 will be used, 2 kbit of a total of 32 kbit. What a waste! 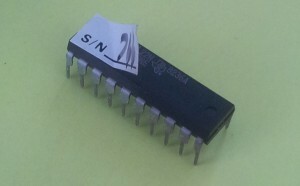 Unfortunately, the 2532 isn’t close in size to the 28L22, nor are the pins arranged in a similar fashion – but this can be solved with a little adapter board, and a few wires. Not the most beautiful solution, but who cares, it works! 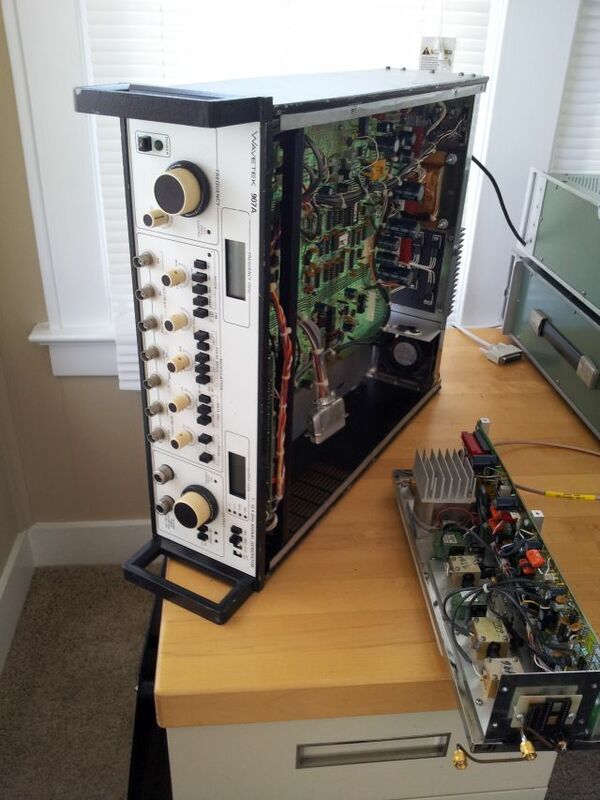 As it turns out, somebody must have opened up the Wavetek 907A before, and it is missing a crucial part – the detector, for the leveling circuit! 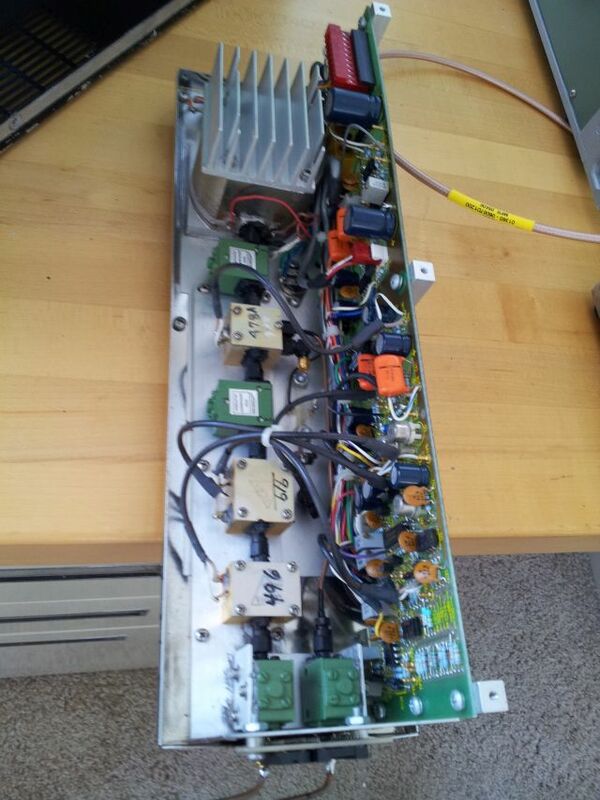 Checked out with the manual – there used to be a 6 dB pad (to get better SWR for the detector), and a positive-type tunnel diode detector (SMA input, SMA output). Nothing I have around here surplus. Wait – there is a spare HP Schottky negative-type detector around in a drawer back home in Germany, and coincidence allowed to have it carried over to the US. 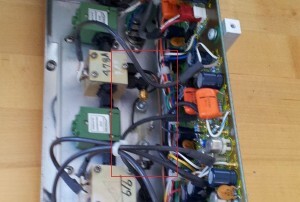 This litte device as SMA input, SMC output, and with a little SMC to SMA adapter, at least a mechanical fit. Next step – there are correction coefficients stored in the Wavetek (in ROM), to compensate for signal losses along the RF chain, and to keep the output calibrated. This will require some more thought, to be continued. 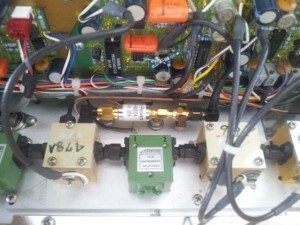 A Wavetek 907A – this apparatus generates microwaves from about 7 to 12.4 GHz. All the typical modulation capabilities are provided, FM, AM, pulse. Found it on xbay, USD 45. That’s less than the value of the two precision bulkhead SMA to N connectors. You can see the YIG oscillator on the top, followed by an isolator, leveler, isolator, two attenuators, isolator. There is a side chain, starting at the leveler, and with an additional isolator: this is a non-attenuated reference signal, which is available as an auxilliary output at the front panel – quite handy to use as as a signal for PLL stabilization, or other purposes. (3) Only have a manual with partial, cut off schematics! (4) Some TLC required, de-dusting – done. 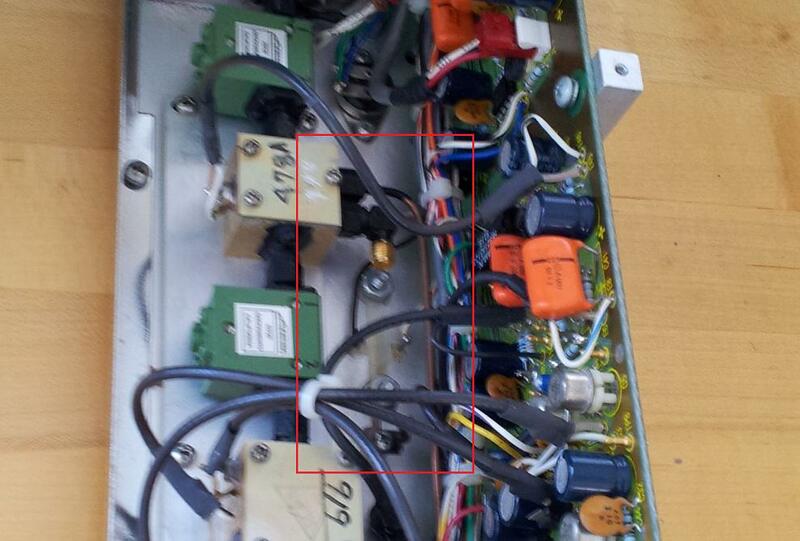 (6) Some switches don’t work properly – fixed with the help of DeoxIT D5.